Vegetable oil utilization is determined by its fatty acid composition. In soybean and other grain crops, during the seed development oil accumulation is important trait for value in food or industrial applications. Seed development is relatively short and sensitive to unfavorable abiotic conditions. These stresses can lead to a numerous undesirable qualitative as well as quantitative changes in fatty acid production. Fatty acid manipulation which targets a higher content of a specific single fatty acid for food or industrial application has gained more attention. 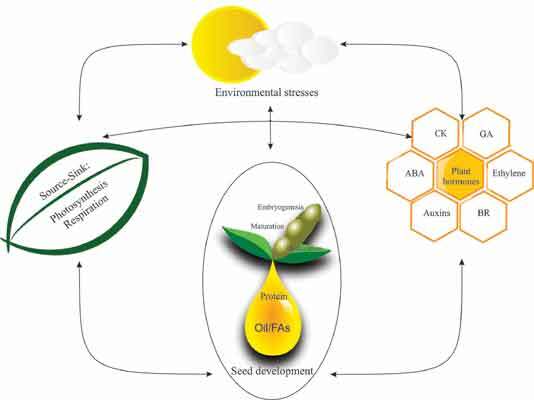 Despite several successes in modifying the ratio of endogenous fatty acids in most domesticated oilseed crops, numerous obstacles in FA manipulation of seed maturation are yet to be overcome. Remarkably, connections with plant hormones have not been well studied despite their critical roles in the regulation and promotion of a plethora of processes in plant growth and development. While activities of phytohormones during the reproductive phase have been partially clarified in seed physiology, the biological role of plant hormones in oil accumulation during seed development has not been investigated. In this review seed development and numerous effects of abiotic stresses are discussed. After describing fatty acid and phytohormone metabolism and their interactions, we postulate that the endogenous plant hormones play important roles in fatty acid production in soybean seeds. Soybean, Seed development, Cytokinin, Abscisic acid, Fatty acid.